We allow the couples to select from a long list of approved catering companies. varies based on date… $995 to $4495 and includes a day of manager, Chiavari chairs, tables, two ballrooms, marquee with their names (sp), audio system, use of large LED screens, uplights and access to our photo booth. nope. we allow outside catering as we don’t' have in house at all. you have to select from our long list of approved caterers. Lots of city parking nearby includes lots, one directly across the street. 2 of them.. one for each ballroom. Two of them but one dedicated ballroom for wedding ceremonies. 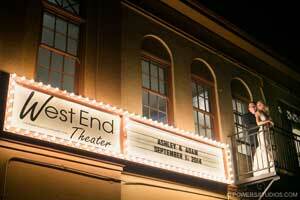 The West End was just recently painted and we now have 2 ballrooms for the clients use.